For use with STANDARD size winches with a 4.875" bolt up pattern. 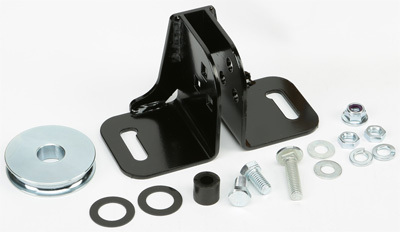 Replaces standard winch fairlead during plow season. Provides larger 2-1/8” diameter roller for smoother cable movement when plowing compared to standard 7/8” rollers. Roller has a curved cable groove to help eliminate cable flattening, which leads to snapped cables during the plowing season. Eliminates potential cable kink due to small roller contact and abrupt angle rolls. Multiple roller positions for different applications and cable angles. Recommended For Steel Cable use ONLY!!!!!!!! !